HUNTSVILLE ALABAMA CIVIL WAR SOLDIERS BALL DANCING VIRGINIA REEL DANCE FASHION. This genuine antique wood-cut engraving is titled "SOLDIER'S BALL AT HUNTSVILLE, ALABAMA--DANCING THE VIRGINIA REEL", published in "Harper's Weekly" April 1864. This dated engraving from the year of 1864 is 11 x 15 inches in size with wide margins. It is in excellent condition, highly displayable and ready for framing and is guaranteed to be as described. The lines you may see in some of the older engravings are from the adjoining of woodblocks to make/produce the complete image. In order to speed up the process of wood-cut engravings, several artists carved a section of the block of wood then the blocks were adjoined, stamped in ink then onto this page. Also occasional spots or foxing are usual for these older engravings. They do not detract from the value or splendor of the engraving but only attest to it's authenticity! This beautiful and decorative antique engraving would make a great addition to any Home, Office or Restaurant decor! I have provided Antique Engravings, Prints, Maps & Newspapers globally to museums, Institutions, art dealers, researchers, genealogists, movie sets, interior designers, authors, knowledgeable collectors and beginners too. The comments buyers have made in my "feedback" file are an indication of the quality product and exceptional service I deliver. Authenticity of all items , as described in each listing, and the accuracy of that description, is guaranteed unconditionally. Everything I sell is guaranteed to be original/authentic as I do not deal in copies/reproductions. At your fingertips here at this website you have a gallery of many thousands of Antique Engravings, Prints, Maps and Newspapers. Find the subject matter you are looking for using my Store Search engine provided. Every item I sell is genuine/original , NOT reproductions and guaranteed to be as described. Thank you very much for taking the time to stop in and look at these remarkably well preserved historical relics of America's past! FREE scheduling, supersized images and templates. 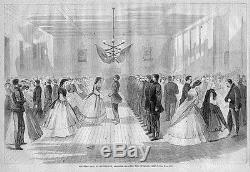 The item "HUNTSVILLE ALABAMA CIVIL WAR SOLDIERS BALL DANCING VIRGINIA REEL DANCE FASHION" is in sale since Sunday, August 22, 2010. This item is in the category "Collectibles\Militaria\Civil War (1861-65)\Original Period Items\Posters & Prints". The seller is "nls" and is located in New London, Minnesota. This item can be shipped worldwide.